DairyNZ is excited to be launching a movement that will showcase the work by dairy farmers to improve New Zealand’s waterways, and encourage every New Zealander to do their bit for our rivers, lakes and beaches. Because, as water quality specialists will attest, we can’t do it alone. Tim Mackle explains what’s driving the momement and what you’ll see over the coming months. For a long time now we’ve been hearing from farmers that DairyNZ needs to do a better job of showing the public the work you do to look after your land and waterways. We also know water quality is the number one issue of concern for Kiwis when it comes to dairy farming, and the public wants to know more from us. We think much of our work to share your stories with media has helped. In the last financial year, we ran more than 850 media articles about dairy and farming activity, and we’ve seen New Zealanders become more positive about dairy farming over the last 18 months. Our dairy sector has a powerful story to share about what we’re doing to improve water quality in many catchments, and this is something we know you are committed to. We also know that we can’t do it alone – every New Zealander needs to play their part. Through this movement we will be sharing more stories that show your passion for your waterways. 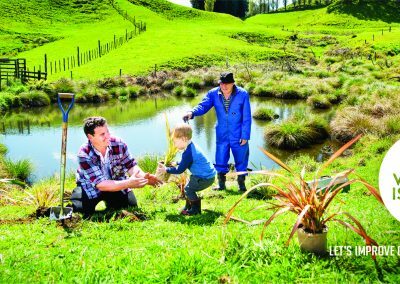 We will also be leading the charge to encourage and inspire every New Zealander to think about their personal impact on our country’s water quality. We’re excited, and we’re ready for the conversation this movement will start. range of stories, science and research, and visuals of how people engage with their waterways. Most of all, this campaign will showcase the inspiring activity being carried out by you, and other New Zealanders, to improve our country’s waterways. Check out the ‘story of a river’ video at thevisionisclear.co.nz and keep an eye out for other videos, tips for protecting our waterways, social media activity and advertisements (online and print). We hope the end result will be a powerful national movement where we’re all working to improve our waterways. More information will be turning up in your letterbox soon. We’d love you to get involved and support this movement. Please share the content any way you can – whether it’s through social media or just telling your family and friends about it while you’re having a BBQ. Because if everyone plays their part, it all adds up to healthier waterways – which benefits us all.